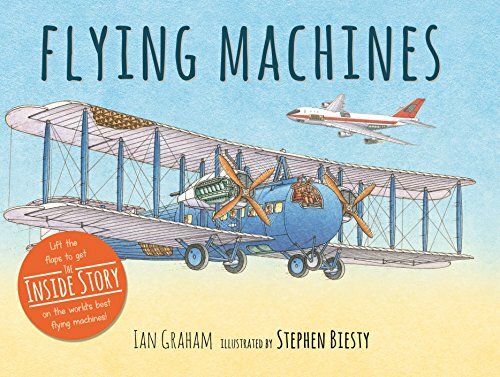 There are no contents pages or list of chapters in this book to slow the young eager mind as the writer and illustrator send the reader right back to the early days of pioneering flying machines on the very first pages. This robust book is perfect for inquisitive fingers—young and older—with numerous, durable lift-up flaps giving a surprisingly detailed look inside the world of aircraft. This fascinating and beautifully created book strikes that necessary balance between informing and entertaining—for both parent and child! The illustrations are “real” enough for a young eye to identify with the images, and sufficient detail is given without drowning the reader in the complexities of these machines. The text is in bite-sized chunks about the various attributes of each machine. The language is simplistic but accurate, with embellishing details tucked away under the lift-up flaps. The reader grows in knowledge comfortably, with “bendy wing-tips” leading to a more detailed explanation of how “the curved shape” of the wing is called “an aerofoil or airfoil . . . which helps to create an upward force called lift.” Equally suitable for all curious minds, Stephen Biesty's Flying Machines demystifies flight and is a must have for flying fanatics.